In this map we see the lands that contain much of her story, and many of the other characters later in the novels. We see the ruins of the cities destroyed by the Dothraki, and the lands down to the Red Waste where Daenarys wanders in the wilderness before stumbling across the questionable haven of Qarth. 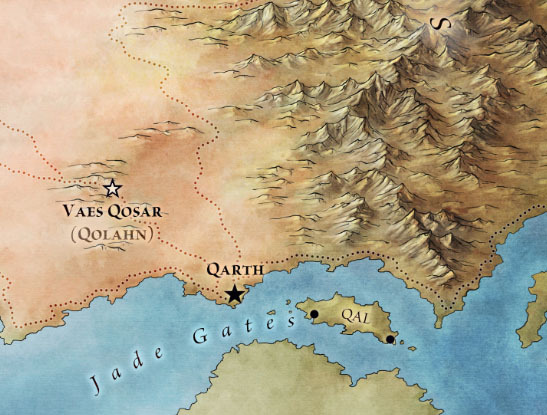 In this map we can see the importance of Qarth as a port, sitting in a dominant position right at the Jade Gates. With the bleakness of the Red Waste to the North and West, and the vastness of the Bone Mountains to the East this must be a city that lives and dies on it’s sea trade. 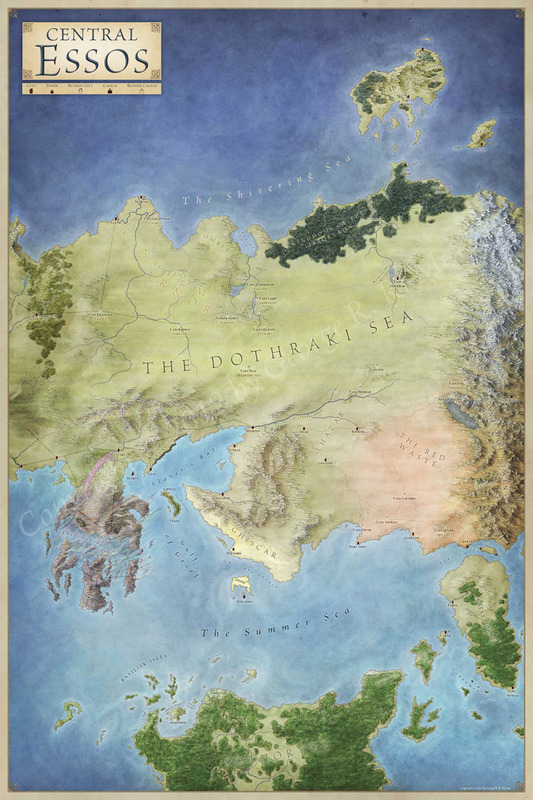 Whereas the books focus on the route of Daenarys, the maps have the luxury and the space to detail the lands to the north, south and east of her travels. To the north we have two lost Kingdoms – the Kingdom of the Ifeqevron, and the Kingdom of Sarnor. 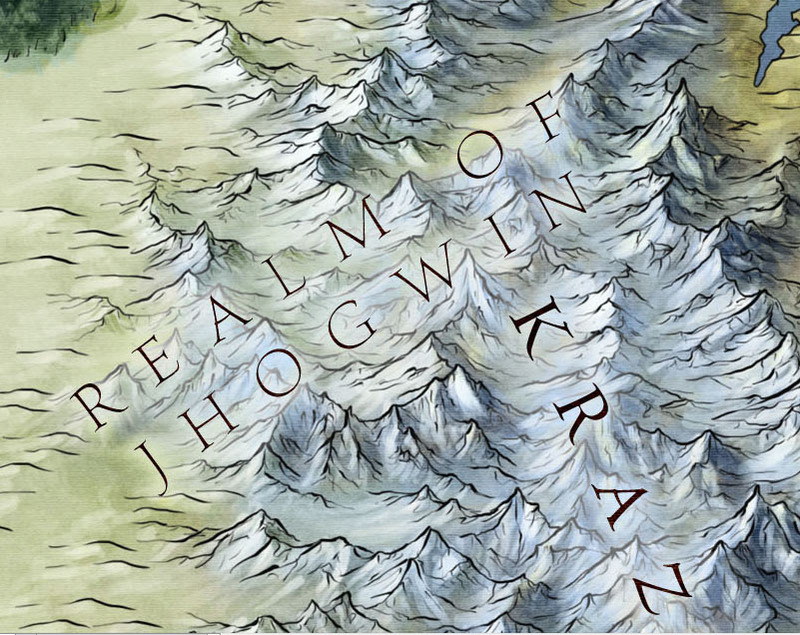 To the NE at the top of the Bone Mountains that split the world we find the Realm of Jhogwin. In that thumbnail you also get an idea of the art on the mountains. So many mountains. 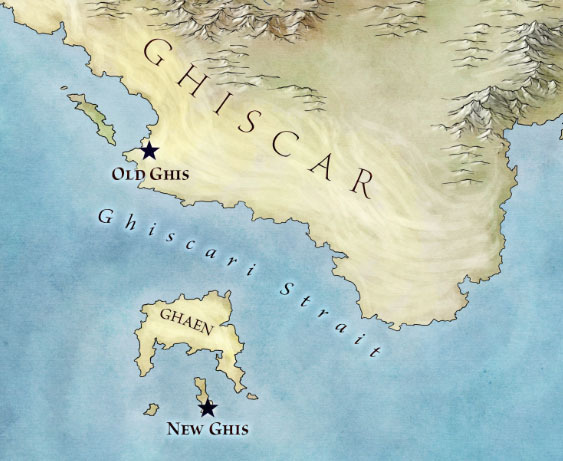 Ghiscari Strait, © George RR Martin 2012, used with permission. Far to the north we see the mysterious Isle of Ib – not to mention the fabulous painted mountains and or course the desolate waste of old Valyria. But it’s the little touches that caught my eye when I was illustrating these. Why did Ghis move from Old Ghis to New Ghis? Is it to do with the sweeping desert that surrounds the coast here? IIRC, the Valyrians got so fed up putting Ghiscar’s rebellions down that, after the fifth time they tried to rebel, the Valyrians burned the city to the ground with their dragons and then salted the ground. I don’t think we know when New Ghis arose. Some have suggested it was only founded after the Doom destroyed Valyria, so the Ghiscari knew they wouldn’t be crushed again. Is it known whether that was the reason for the desert? I realise Valyria screwed up their own part of the world, but a major city like Old Ghis in the middle of the desert seems a little surprising unless that came later. Thanks for the update on the ways of the Valyrians – that’s good to know! I’d presume that was the reason for it. No reason for it to be there otherwise. Similar to in A CLASH OF KINGS, it’s hinted at that the Red Waste hadn’t always been there and had swallowed up lots of cities as it spread (presumably that might also be why Qarth was built where it was, but was able to survive due to its coastal positioning). Apparently some of the new locations shown on the maps will be expanded upon, in terms of history and description, in THE WORLD OF ICE AND FIRE out later this year (hopefully), so we may get some explanations for those things then. Yep, I’m really looking forward to the World of Ice and Fire later this year. That should shed a lot more light on some of the weirder locations on the edge of the Known World.